Line from the Movie: "I know that laugh. It's the 7-Up guy!" Seth MacFarlane and company bring their take on the Star Wars saga to a close with It’s a Trap, a spoof of 1983’s Return of the Jedi. 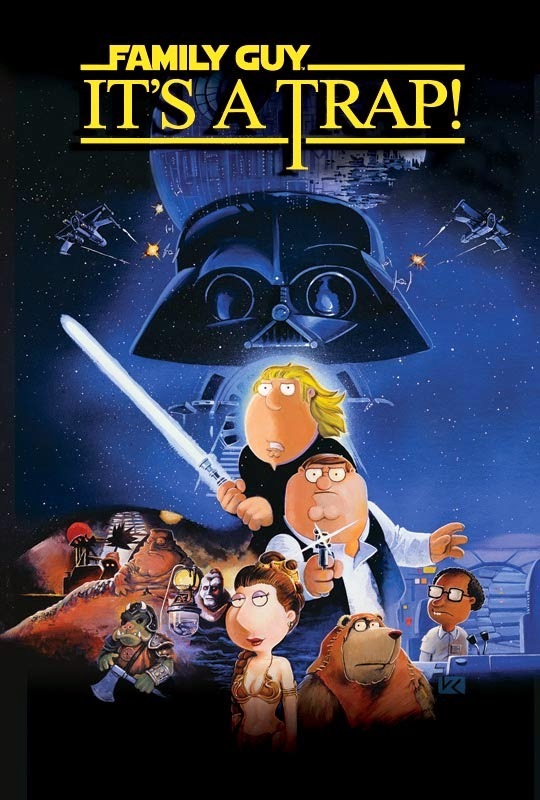 Those familiar with Blue Harvest and Something Something Something Dark Side, the first two chapters in the trilogy, will know the set-up: The Griffin family, along with other characters from The Family Guy, assume the roles of Luke (portrayed by Chris Griffin), Leia (Lois), Han (Peter), Chewbacca (Brian the Dog), Darth Vader (Stewie), and the rest of the Star Wars gang. After freeing Han from the clutches of Jabba the Hut (played by the Griffin’s neighbor, Joe), our heroes set to work trying to destroy the new Death Star, which is still under construction. What’s more, they discover the Emperor himself (Lois’ father, Carter Pewterschmidt) is on-board, inspecting the enormous station. While Han and Lois attempt to disable the station’s force field on the nearby Moon of Endor, Luke heads to the Death Star to confront his father, Darth Vader, and the Emperor, both of whom try to convince the young Jedi to join the Dark Side, all as an armada of rebel ships, under the command of Lando Calrissian (Mort), prepare to attack. Also along for the ride are a few characters from MacFarlane’s other animated series: American Dad (Roger the Alien as Moff Jerjerrod, Klaus the Fish as Admiral Ackbar) and The Cleveland Show (Tim the Bear plays an Ewok, while Rollo is a rebel pilot). As with the first two entries, It’s a Trap looks damn good, recreating many images from Return of the Jedi to perfection, right down to the unfinished Death Star. That said, this final chapter isn’t nearly as funny as its predecessors. In fact, I only laughed a handful of times. The problem, I think, is the writers weren’t big fans of Return of the Jedi, and unlike Blue Harvest and Something Something Something Dark Side, which paid homage to Star Wars and The Empire Strikes Back, respectively, as they were spoofing them, It’s a Trap is short on love for the original film. In the very first sequence, when the lights go out while the Griffins are watching TV, Stewie inquires “We’re doing Jedi now, aren’t we?” at which point Peter sighs and says ”Let’s just get through this”. Then, during the opening scroll, as we’re being updated on the story thus far, we read the following: “Okay, you know what, we don't care. We were thinking of not even doing this one. Fox made us do it.” Throughout the entirety of It’s a Trap, you get the distinct feeling its creators just didn’t have their hearts in it. The movie isn’t a total wash-out; again, it looks great, and a few scenes, like when the Emperor electrocutes a couple of kids as he's floating in a pool, are pretty funny. But It’s a Trap is definitely missing the love, and as a result is the least entertaining of the trilogy.